Crypt Trip returns! Following their last album Rootstock (HPS 079CD/LP/LTD-LP, 2018), the Texas rockers are delivering more cosmic American sounds straight to your ears, mind, and soul. Their new album, Haze County, sonically and lyrically explores the complexities of space and time and then brings you back down to the very Earth you're made of. Nine new songs make up the band's most focused and organic effort to date. Mixing elements of hard rock, psychedelic, and rural music, each track is unique and has something different to say. Loud Fender amps and a pounding rhythm section immerse you in an enticing groove on some tracks, while dreamy guitars take you away in others. Staying true to a Texas tradition, the album features a special guest, Geoff Queen, on pedal steel, adding an entirely different color to the tonal palette. Haze County was recorded and mixed by James Campbell at Cibolo Studios in San Antonio, Texas. It was mastered by Jerry Tubb at Terra Nova Digital Audio in Austin, Texas. High quality analog equipment was used at every stage of production for the best possible "vintage" sound. For fans of: The James Gang, Epitaph, The Byrds, Lynyrd Skynyrd, Humble Pie, Allman Brothers Band, Bubble Puppy, Homer, Jericho Jones, Flying Burrito Brothers, Waylon Jennings, Led Zeppelin, Grateful Dead. Crypt Trip is a group from Texas that plays hard rock music. Originally formed in Dallas in 2013, the first incarnation of the band had a heavy psychedelic sound that was reminiscent of a dark nineteen seventies underground. It wasn't long before guitarist/singer Ryan Lee and bassist Sam Bryant relocated to Central Texas where they met drummer Cameron Martin and began to solidify their sound. Taking influence from aged rock records, jazz methodology, and their cultural roots in the cosmic American South, their music presents you with a genuinely personal experience. 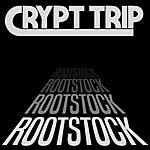 Take a trip with Rootstock, the new album from the Texas natives Crypt Trip. You'll find that the use of mind-altering substances is not necessary to feel the raw psychedelic power of the band's sophomore effort. With its many peaks and valleys, Rootstock will take you on a journey through musical dynamics and diverse musicianship. You will be confronted throughout with both high-energy rock and gentle moments of refined delicacy. No gimmicks. No strings attached. This is a simple and pure representation of three musicians in a collaborative effort to give you unfiltered Texas hard rock. LP version. Crypt Trip is a group from Texas that plays hard rock music. Originally formed in Dallas in 2013, the first incarnation of the band had a heavy psychedelic sound that was reminiscent of a dark nineteen seventies underground. It wasn't long before guitarist/singer Ryan Lee and bassist Sam Bryant relocated to Central Texas where they met drummer Cameron Martin and began to solidify their sound. Taking influence from aged rock records, jazz methodology, and their cultural roots in the cosmic American South, their music presents you with a genuinely personal experience. Take a trip with Rootstock, the new album from the Texas natives Crypt Trip. You'll find that the use of mind-altering substances is not necessary to feel the raw psychedelic power of the band's sophomore effort. With its many peaks and valleys, Rootstock will take you on a journey through musical dynamics and diverse musicianship. You will be confronted throughout with both high-energy rock and gentle moments of refined delicacy. No gimmicks. No strings attached. This is a simple and pure representation of three musicians in a collaborative effort to give you unfiltered Texas hard rock. LP version. Limited edition clear vinyl. Crypt Trip is a group from Texas that plays hard rock music. Originally formed in Dallas in 2013, the first incarnation of the band had a heavy psychedelic sound that was reminiscent of a dark nineteen seventies underground. It wasn't long before guitarist/singer Ryan Lee and bassist Sam Bryant relocated to Central Texas where they met drummer Cameron Martin and began to solidify their sound. Taking influence from aged rock records, jazz methodology, and their cultural roots in the cosmic American South, their music presents you with a genuinely personal experience. Take a trip with Rootstock, the new album from the Texas natives Crypt Trip. You'll find that the use of mind-altering substances is not necessary to feel the raw psychedelic power of the band's sophomore effort. With its many peaks and valleys, Rootstock will take you on a journey through musical dynamics and diverse musicianship. You will be confronted throughout with both high-energy rock and gentle moments of refined delicacy. No gimmicks. No strings attached. This is a simple and pure representation of three musicians in a collaborative effort to give you unfiltered Texas hard rock.